We often say that education for all is a key ingredient in the achievement of equal opportunity. No matter one’s socio-economic background, education is the great equalizer that creates equal opportunity in a world that is often unequal. Political leaders everywhere who profess a concern for the poor and the oppressed have frequently stressed its importance. In 2003 Nelson Mandela remarked that “Education is the most powerful weapon which you can use to change the world” (Mandela, 2003). George W. Bush’s ill-advised, but well-intentioned, No Child Left Behind legislation and Barack Obama’s follow-up, Race to the Top, are both grounded in the ideal of quality education for all children. The political consequences of education are enormous. George Washington Carver clearly understood this when he stated that “Education is the key to unlock the golden door of freedom”(Carver). Education is the primary force that creates what political philosophers often call “positive freedom,” (Fromm, 1941, Berlin, 1969) that is, the capacity to actually do something that one considers worthwhile instead of simply being free from oppression. The latter, of course, is essential to a good life, but positive freedom is the key to its attainment. It is argued that nothing accomplishes this goal like education. Unfortunately, we have a long way to go before realizing the ideals associated with universal education. It turns out that our system of public education does not create equal opportunity for all. Instead of equalizing opportunity, our K-12 educational system simply reproduces the ongoing social stratification. The following graph tells the story as it shows the relationship between college board scores and family incomes. Source: College Board. See notes below. The pattern is remarkably clear. As family incomes go up, so too do college board scores. The relationship is so close that we might imagine we were measuring the same thing instead of two different things. If our system of universal education served an equalizing function, we should find no relationship between college board scores and income. 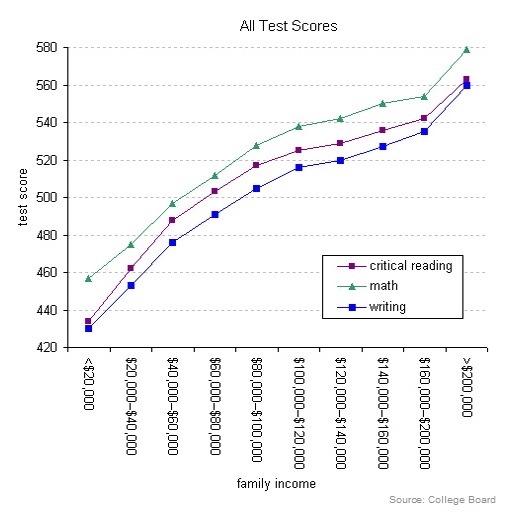 Test scores should vary independently of family incomes. Instead, the structural and personal advantages that come with higher income translate directly into higher SAT scores. Those scores, in turn, provide admission to more elite institutions that reinforce rather than break down existing class differences in the United States. Looking at the graph below, we can estimate the numbers of students falling into each of the college board score categories. About 58% of households will fall at or below $60,000 annual income. This means that students from those households will have average board scores below 500. 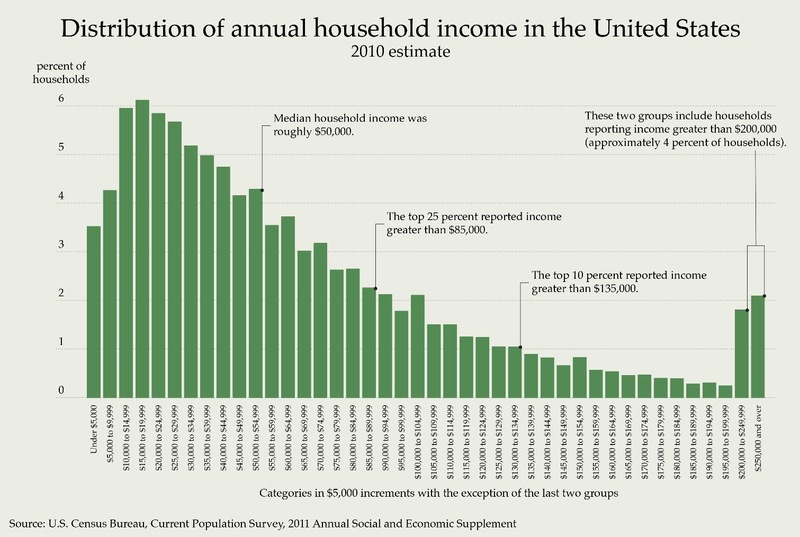 Only 4% of households will have incomes larger than $200,000 income per year. Students from those households will have the highest college board scores. Describing this remarkable relationship between test scores and family incomes is easier than discovering its causes. One probably cause is found in how we fund public school systems in the U.S. Families with higher incomes live in neighborhoods with a higher property tax base than families in poorer neighborhoods. Because our public school system is funded largely by property taxes, students from families with higher incomes will have better schools. They will be better in terms of facilities, extra-curricular activities, and more highly paid teachers. Beyond funding issues, however, there are many social and environmental issues to consider, most of which are beyond the control of schools and teachers despite their best efforts. Many low income neighborhoods are populated by students under enormous pressures. Students who are highly stressed do not learn well. Berlin, Isaiah. “Two Concepts of Liberty,” in Four Essays on Liberty. Oxford University Press. 1969. Carver, George Washington. Quote attributed widely to Carver. Date and Source unknown. College Board. College Board Scores and Family Income. As shown in Thomas B. Edsall, “The Reproduction of Privilege,” New York Times, March 12, 2012. Fromm, Erich. Escape from Freedom. Farrar and Rinehart. 1941. Mandela, Nelson. “Lighting the Way to a Better Future.” Presentation delivered at inauguration of Mindset Network, University of the Witwatersrand, Johannesburg, South Africa. July 16, 2003.